Naveen Patnaik, chief minister of Odisha and president of Biju Janata Dal (BJD), has declared that his party would not support the UPA government at the Centre in any circumstances. The Congress-led UPA government is in search of new allies after Trinamool Congress chief Mamata Banerjee withdraw support to the centre government over diesel price hike and foreign direct investment (FDI) in retail. When asked about the possibility of BJD's support to the UPA government, Patnaik said, "Withdrawal of support by the TMC has certainly put the UPA government in a weak position. 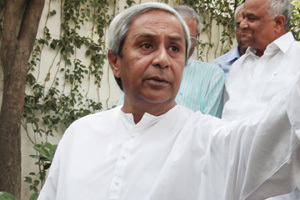 But there is no question of the BJD extending its support to the UPA." Patnaik was speaking to reporters just before embarking on his official tour of New Delhi. He added that BJD was ready for a mid-term Lok Sabha polls if any such situation arises due to ongoing tussle between Congress and its allies at the Centre. In New Delhi, Patnaik met Civil Aviation Minister Ajit Singh, who assured him that Odisha's Biju Patnaik Airport would soon be upgraded to international one. Ajit Singh said the aviation ministry would advise domestic airlines including Air India to start international operations from Biju Patnaik Airport.